Here is the Sega CDX! What is it you say? 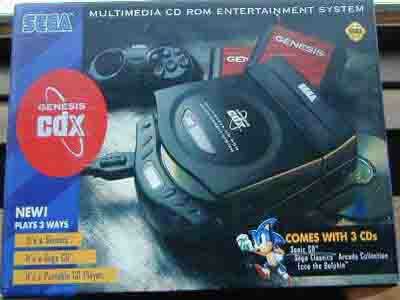 It's a Sega Genesis, it's a SegaCD, and it's a Portable CD player all in one (nice package, eh?). The system is only 4 X 8 in size (slightly larger than the original Gameboy) and uses the Genesis2 style RF and AC adapters. Sadly, despite it's value, it was never well supported by Sega and died a quiet death much like the portable Sega Nomad. The system is well worth looking into and the system will work with the Sega 32X as well. This is the perfect system for the Sega fan who wants it all in one compact package. SEGA CDX overall rating: 92/100 It maybe rare but it is so worth it! Find the Sega CDx on eBay here!